The UC San Diego Sulpizio Cardiovascular Center is the first hospital-based project in the region to receive LEED Gold certification from the United States Green Building Council (USGBC). 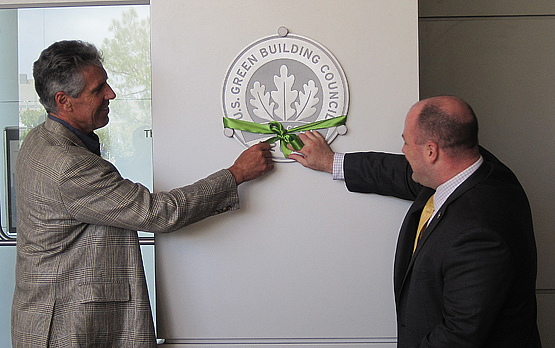 Representatives from the USGBC – San Diego Chapter recently presented a plaque to the building project and design team. LEED – Leadership in Energy and Environmental Design – promotes a “whole-building” approach to sustainability by recognizing performance in several key areas. Though the Sulpizio Cardiovascular Center project began in 2005, prior to “LEED” guideline establishment, leadership at UC San Diego, along with the design and construction teams, believed in creating a building that was environmentally thoughtful. The facility design takes full advantage of the movement of the sun with shading devices and massing elements to minimize heat gain and reduce energy consumption. The design also embraces the idea of blurring the lines between interior and exterior regions, to provide the facility with a “natural” feel that picks up on the stunning geography of the nearby coastal canyons. Kot went on to explain that the indoor environmental quality of UC San Diego Sulpizio Cardiovascular Center makes this building a superior facility for patients and staff. “This building promotes good health by combining energy conservation techniques with the very best care available and that is what we are here to celebrate in this LEED project,” said Kot.